Dining Options: We offer an array of dining options for your special event including Breakfast, Brunch, Lunch, Dinner and Hors D’oeuvres. Select between the Buffet-Style or a Plated Service, Butler Style service available for Hors D’oeuvres. All menu item / food item selections and details are required at least seven (7) days prior to your event. No changes can be made after this deadline. Changes in room arrangements within 72 hours WILL be subject to additional labor charges. Plated meals require an advance order with the exact number of specific meals. Menu options and prices depend on your selection and/or market price. 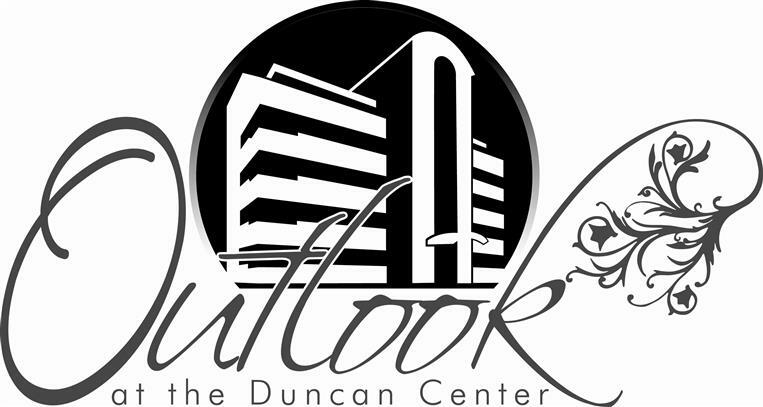 Due to standard health practices, state food codes and insurance regulations food and drink paid for but not consumed, will not be permitted to leave the Outlook at the Duncan Center’s premise. requirement. In the event that no guarantee is given, the expected number from the BEO will be used. We will charge for the guarantee or the number served, whichever is greater. Seating and food preparation will be provided for 2.5% above the guaranteed attendance for 200 guests or greater. Seating and food preparation will be provided for 5% above the guaranteed attendance for fewer than 200 guests. Please include all vendors in guest count. bubbles or if more than the standard cleanup is required at the close of the function. Fog machines and open flames are prohibited. The person responsible for the banquet as the undersigned on Terms and Conditions will be held accountable for damages of Outlook Events, LLC and the Duncan Center. needs. A $25 charge will apply for the use of each LCD projector. Wedding Cakes: Outlook Events, LLC can recommend several local businesses that create beautiful and delicious wedding cakes should you choose. If you wish to provide your own, we require it be made and delivered by a licensed and insured vendor. Outlook Events, LLC charges a cake cutting fee of $60. Cake delivery times will be approved by the Outlook Event Coordinator and /or Event Manager. Proof of Insurance and Business License is Required for all off- site vendors. vary. If a cake is brought in, Outlook Events, LLC charges $25 for a cake table, linen, plates, utensils, cake cutting service, etc. Proof of Insurance and Business License is Required for all off- site vendors. Contractual Liability: Outlook Events, LLC will not be held liable for failure to meet contract due to conditions beyond its control such as labor troubles, disputes, strikes, acts of God, extreme weather, etc. Alcohol: It is the responsibility of the banquet host to ensure that no one under the age of 21 drinks alcoholic beverages. It is further understood that an event can be terminated if anyone under the age of 21 is found with alcohol. The event will also be terminated in the instance that any guest of any age to bring in outside alcohol. The employees who serve alcoholic beverages have been instructed to refuse to serve the same to any person requesting service in violation of the law; or whenever the person requesting service has (in the employee’s unrestricted judgment) consumed an excessive amount of alcohol within a given time as prescribed by law. Such refusal shall always be respected and complied by the person, his/her family, and guests. Event Deposit: A $500.00 deposit is required to book a reservation for the Outlook; a $250 deposit is required for the Bradley, Barrett or Mulford rooms. This amount is deducted from the final balance. All Deposits are non-refundable. Wedding Deposit: A $500.00 deposit is required to book a reservation for the Outlook; a $250 deposit is required for the Bradley, Barrett or Mulford rooms. This amount is deducted from the final balance. All Deposits are non-refundable. All food and beverage charges are subject to a 20% Catering Service Charge. attendance in accordance with the one-week prior requirement. This guaranteed number is what you will be billed. If your number increases unexpectedly, we will be happy to accommodate the overage with an equal or comparable meal and bill you accordingly. Additional charges may be due at the end of the function in the instance that extra/last minute services are requested upon which time payment shall be discussed and agreed upon. Additional charges may consist of additional cleaning, additional event time, additional meals served, bar tabs, etc. Credit Card Payment: Outlook Events, LLC charges a 3% administrative credit card processing fee for any payments made by credit card. Event cancels between 2 and 6 months prior to the event date will be charged 10% of final bill | Event cancels within 2 months of event, one half of the final bill needs to be paid | Event is canceled within two weeks of the event date, the entire bill needs to be paid in full. Returned Checks: Outlook Events, LLC charges a $60.00 returned check fee.